A solidier slapped Shaykh Ibrahim ibne Adham (Allah have mercy on him) mistakenly. On recognizing his error he returned to apologize. Shaykh Ibne Adham (Allah have mercy on him) told him that when you slapped me I supplicated to Allah to grant you paradise (jannah). The shocked soldier requested an explanation for this extraordinary behaviour. Shaykh explained that I was certain that I will be rewarded (by Allah) for this slapping and it made me uncomfortable that you cause me reward and good and in return you get sin and punishment (in here-after). 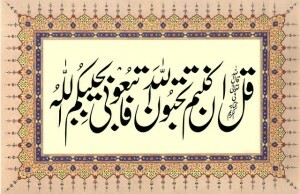 Therefore I supplicated for you. This entry was posted in B. Praise worthy morals, D. Acts of Worship, E. States, H. Whispering & random thoughts, J. Rights , Q. Akabir, T. Tarbiyet on April 18, 2010 by 'abd.